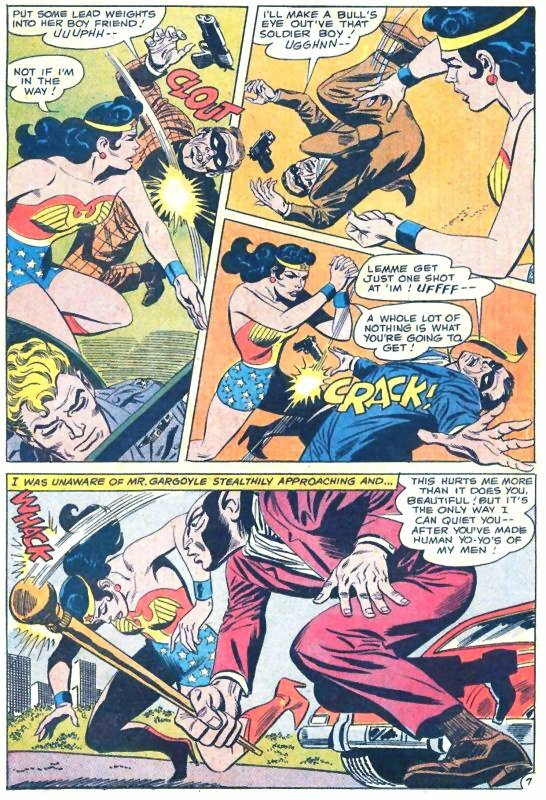 This issue sees the return of the single story with an odd epilogue, in which Robert Kanigher himself is depicted addressing the readers directly about the story’s outcome. 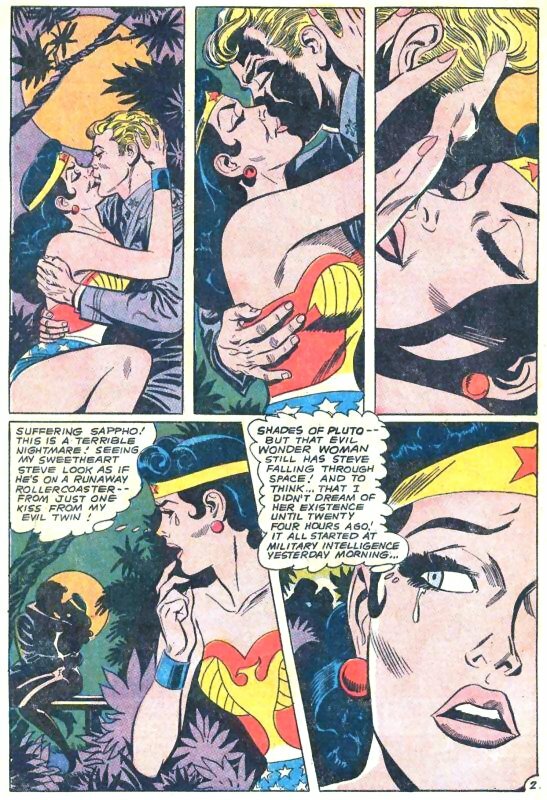 The story opens with Wonder Woman apparently in a passionate embrace with Steve Trevor. As their lips caress each other it is revealed that in fact this is a duplicate of the Amazon Princess and the real version is watching from the bushes, crying. She can see that Steve is in rapture in the arms of her evil double and she cannot believe that just twenty four hours earlier she did not even know of her double’s existence. It had all started the morning before at Military HQ. She had been working in her office as Diana Prince when Steve enters, saying that Wonder Woman had arranged to meet him here. 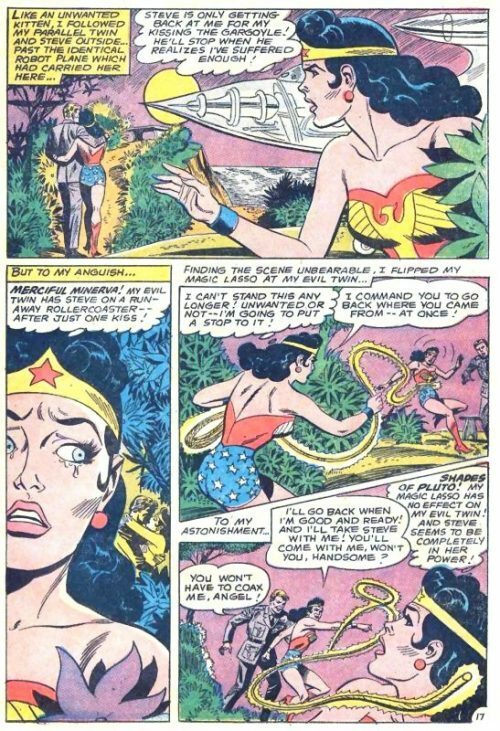 Diana realises that if she does not manage to change into Wonder Woman, Steve might begin to suspect that she and Wonder Woman are one and the same. She leans out of the window and tells Steve that she can see Wonder Woman sitting downstairs waiting in his jeep. As soon as Steve leaves the office to join her, Diana quickly transforms into Wonder Woman and leaps down from the window into the jeep just in time before Steve arrives. He gives her a welcoming peck on the jeep before climbing aboard and setting off down the street. Wonder Woman asks where they are going and he replies that it is a secret. Unbeknown to them though, inside a Rolls Royce parked on the street, is the villain known as the Gargoyle and his gang. The crook tells his men that he will not rest until Wonder Woman willingly throws herself at him instead of that “pretty boy” Trevor. On his instructions, the gang pull out and cut across the passing jeep, spraying a suffocating cloud from its exhaust. Steve and Wonder Woman slump unconscious and the jeep careers of the road. 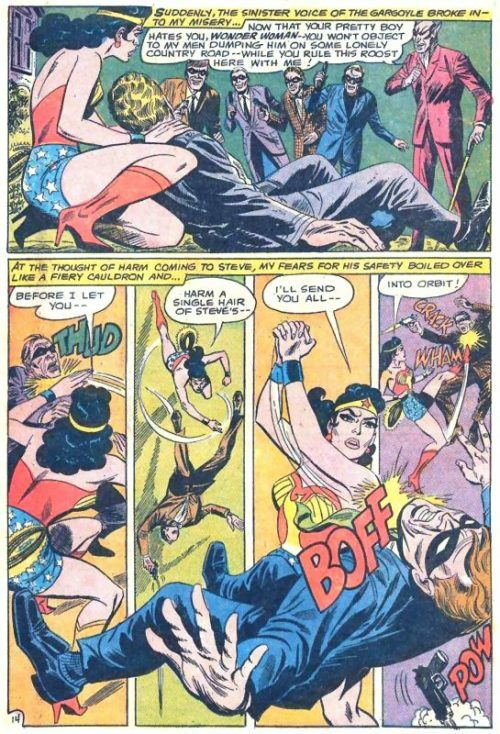 The armed gang leap out as Wonder Woman struggles to regain consciousness again. As they approach her thinking she is out for the count, she suddenly leaps into action, taking them by surprise and knocking them flat. They soon recover as she struggles to her feet and open fire with their guns. Furiously, the enraged gunmen send a rain of bullets at the Amazon Princess but she deftly repels the barrage with her bracelets. She then proceeds to deck each thug in turn but as she does so, is unaware that the Gargoyle has got out of his car. He sneaks up behind the unsuspecting Amazon and uses his staff to club her unconscious. 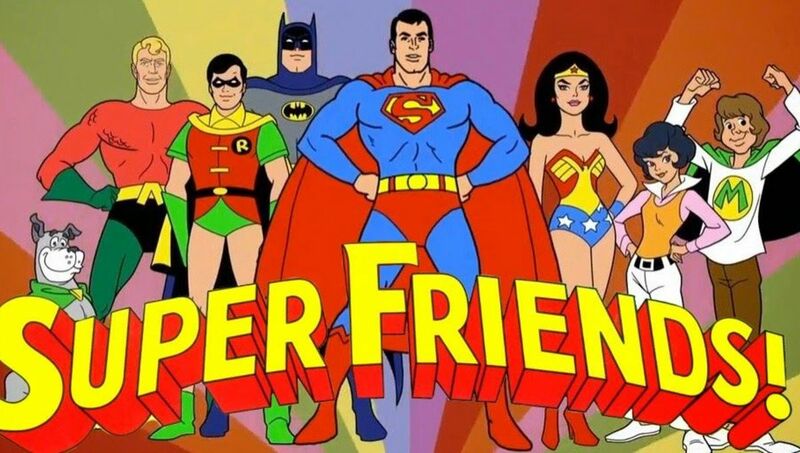 He then orders his men to carry the unconscious bodies of Wonder Woman and Steve into his car. 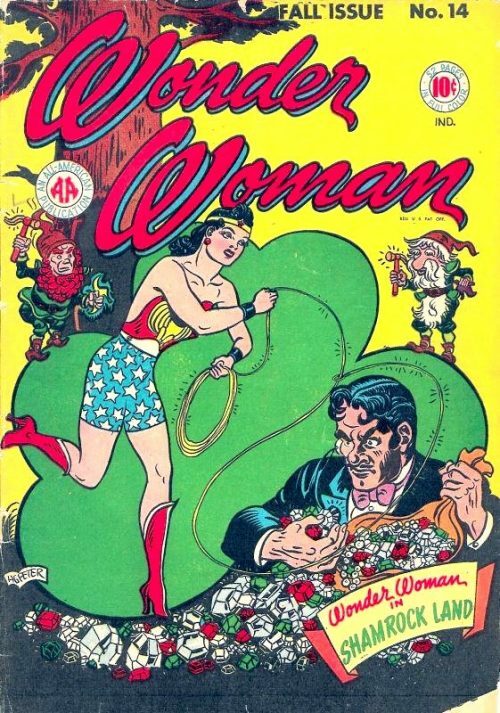 A short while later Wonder Woman comes to and finds herself inside the Gargoyle’s Country Mansion. Her own lasso is tied around her waist and the Gargoyle holds one end. He tells her that he wanted her for his own long before an explosion in his lab ruined his face forever, forcing him to wear a mask. Now he will force her to fall in love with him! First though, she will kiss him! Unable to disobey his instructions, she leans forward and pecks him on the lips. The Gargoyle becomes enraged though and rants that he may as well have been kissed by an Iceberg! She replies that her heart fought the power of the lasso and although it compels her to kiss him, it could not force her to forget her feelings for Steve. The furious Gargoyle leads the Amazon Princess to a courtyard where she is horrified to see a shark infested pool which, in its centre, has Steve hanging on precariously to a protruding rock. The villain informs her that the water is rising and soon her lover will be in reach of the sharks! However, if she swears to give Steve up and love him instead, then she can save Steve’s life. Steve yells across to her not to listen to the crook as he would rather end up as shark food than lose her love. Wonder Woman stands paralysed with indecision as Gargoyle tells her to seal their pact with a kiss in order to save Steve from death. Unable to bear witnessing Steve being devoured alive by the sharks, she passionately kisses the elated Gargoyle. A furious Steve rants at her, yelling “So that’s what you think of my love!”. He rages that she has destroyed what they had between each other and he will never forgive her. In his anger he fails to see a shark diving up at him and is grabbed in its teeth. As he is dragged beneath the water the Gargoyle tells Wonder Woman that Steve is as good as dead, but she snatches the lasso from his hand and dives into the pool. She swims down and sees the shark reach the bottom, banging Steve’s head on the floor and knocking him out. She loops her lasso around his unconscious form and tears him from the shark’s grip before the creature can do any harm. She then carries Steve back towards the surface, smashing the other encircling sharks out of her way. She bursts out of the water carrying her lover and Gargoyle mockingly asks her what sort of reward she expects from her pretty boy after saving his life. As she lays Steve gently on the ground he murmurs in his unconscious state that he hates her for kissing the Gargoyle and he will never forgive her as long as he lives. She is heart broken as Gargoyle and his men approach. The villain says that she will obviously not mind if his men simply dump Steve on some lonely country road, leaving him and Wonder Woman to live happily ever after. 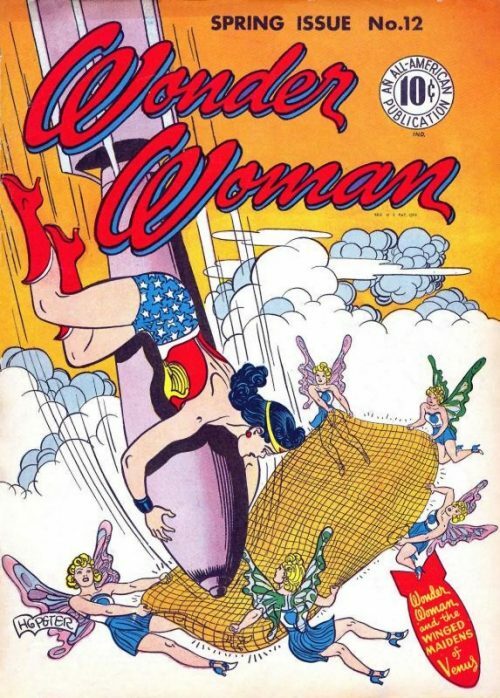 An enraged Wonder Woman launches herself at them, knocking them flying before grabbing Steve, summoning her invisible plane and leaping onboard. The Gargoyle waves his fists at her furiously and yells that eh will never rest until she is in his arms again. Her love will be wasted on Steve because he now hates her. As she sets course for Paradise Island with the still unconscious Steve, she hopes that the Purple Healing Ray will bring him out of his coma and change his mind about her. She lands on her private island just off the shores of Paradise Island, to avoid Steve setting foot on her homeland’s soil. She takes him to her lab and uses the Ray on him, praying that it works. She leans down and kisses him gently as he continues to murmur his hatred of her in his sleep. She leaves the Ray to do its work and walks outside, trying to fight back the tears.A few hours later she returns to the lab to see if she has been successful and his shocked to find that not only is a smiling Steve alive and awake, but is in the arms of a duplicate Wonder Woman. The doppelganger smugly says that she had been watching the whole sorry affair from her own parallel world and had fallen in love with Steve. She had therefore decided to travel across dimensions to claim him for her own! Steve nods and adds that she is the only Wonder Woman he wants as he is through with the real one! 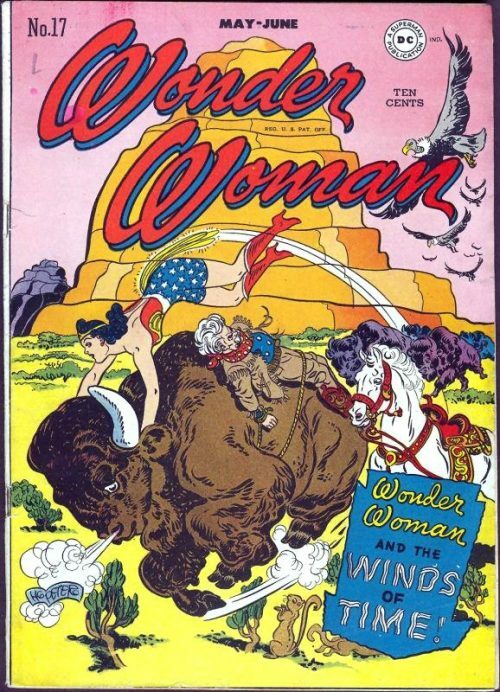 Wonder Woman now follows helplessly as Steve and her twin walk outside towards an identical robot plane. She assumes that Steve is simply trying to pay her back for kissing the Gargoyle and will cease once he realises she has suffered enough. But to her dismay he begins to kiss her double passionately and it becomes very clear to her that this is no pretence on his part. She decides to act and uses her lasso to ensnare her double. She orders her to return to her own world at once but to her astonishment her doppelganger simply removes the lasso and throws it back at her feet, saying that she will return when she is good and ready! What is more, she will take Steve back with her too! Realising the lasso is useless, she wonders what her next move should be and is suddenly joined by her mother and some of the other Amazons. She asks Hippolyta what she should do about Steve and the Queen replies that as an Amazon, there is only one thing she can do. She must compete against her parallel twin for the right to be with Steve. The loser must give him up forever. The twin smiles and adds that as the one being challenged, she claims the right to name the terms of the contest. She declares that it should take place on her own world and she demands that only Steve and her opponent are present. Diana agrees and soon is ready to depart in her robot plane. As her double takes off with Steve on board, she bids farewell to her mother, who wishes her luck. 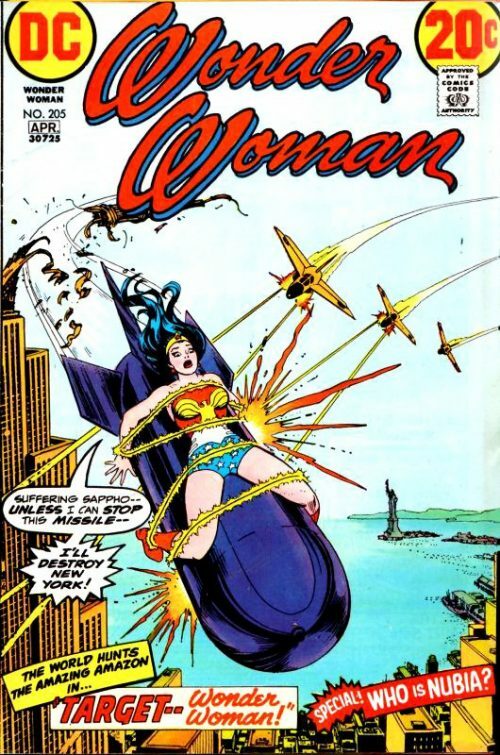 With that Wonder Woman takes off and follows her double’s plane into a strange could. On the other side she sees a replica of Paradise Island below her and touches down next to her opponent’s plane. While this other world looks very much like her own, she wonders whether it is governed by different laws. As the duplicate Amazons and their version of Hippolyta watch, the duplicate Wonder Woman tells Steve to wait inside the laboratory until the winner comes to claim him. 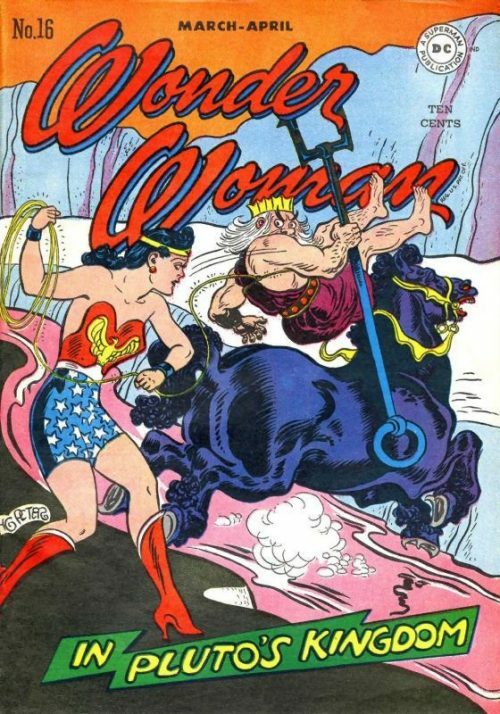 She then leads the real Wonder Woman to the cliff top and instructs her opponent to bind her ankles with her lasso. The duplicate Wonder Woman does the same and explains that the first competition will be to dive off the cliff, swim underwater to a rock and back, before climbing up the cliff face to the top again. The two Wonder Women dive off simultaneously and hit the water together. Wonder Woman concentrates hard on winning as they both begin to swim under the waves neck and neck. After reaching the rock together and turning back to swim to shore again, Wonder Woman suddenly feels very strange. She is shocked to find that her costume no longer fits her and her opponent if beginning to open up a considerable lead. She realises to her horror that she is regressing to a teenager! Reaching the shore, the young girl strains to climb the cliff face but she knows that she is no longer a match for her adult opponent. 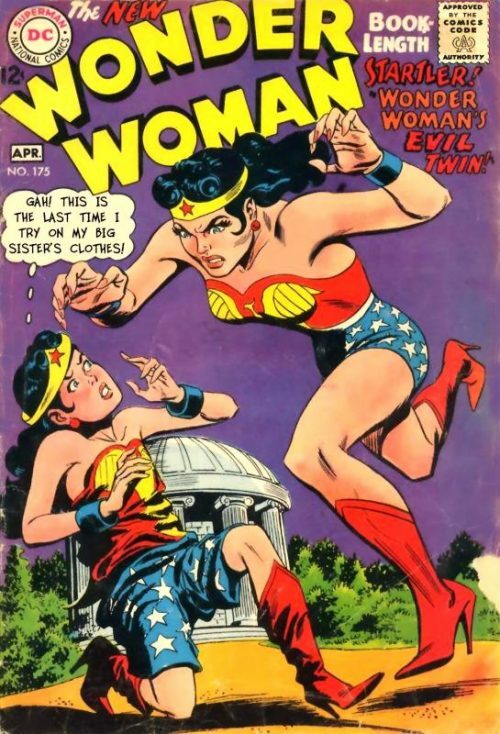 As Wonder Girl reaches the top she is met with mocking laughter as the other Wonder Woman smiles smugly. The next contest involves jumping but again, the adult Wonder Woman has a clear advantage over her tiny competitor and easily wins. The third and final contest is a wrestling match and Wonder Girl valiantly tries her very best to compete. But the duplicate Wonder Woman smashes her to the ground and easily pins her on the floor. The contest is lost! Admitting her defeat, the tearful girl returns to the laboratory alongside her victorious double. The watching Amazons laugh at the bedraggled girl in the loose fitting garments as the triumphant double enters the lab to bring Steve out. But to Wonder Girl’s astonishment Steve had also been affected by the strange physics of the parallel world and emerges as a young boy! He tells the surprised Wonder Woman double that she is too old for him and that he wants Wonder Girl! The two children quickly board the robot plane and fly back through the cloud. As they do they both begin to grow back to heir normal adult selves. Smiling at her, Steve tells her he is back to normal in every sense, as he still loves her.